Whether you are seriously considering a tumble blender for your process or still shopping for a suitable piece of blending equipment, here are 10 basic things you should know and think about before the making final decision. 1. What is a tumble blender? It is a blender equipped with a double-cone or V-shaped rotating vessel. Generally, tumble blenders operate at a speed of 5 to 25 rpm. Diffusion is the main mechanism for mixing: particles are distributed over a freshly exposed surface as the vessel rotates on a horizontal axis. In a V-shaped blender, the batch is continuously being split and recombined. 2. What are the main advantages of the tumble blender design? Tumble blenders are suitable for thorough blending of dense powders, fragile solids, and abrasive materials. They are alsocommonly used for making precise blends when trace components are present (<1%), or when ingredients are vastly dissimilar in size and density. The geometry of the vessel also allows for fast and complete discharge of the blended material. 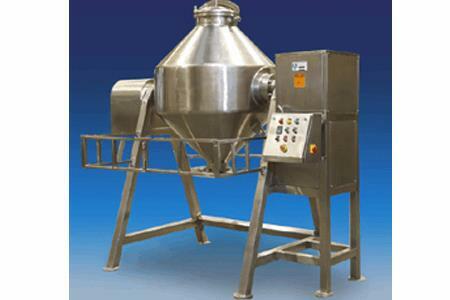 Tumble blenders require a large footprint to accommodate the mixer base, as well as ample overhead space for the vessel to rotate. Operators must always be careful while running the blender. Also, these blenders are not very versatile when sticky or tacky solids, or paste-like materials are present.